When you download MySQL Installer for the first time, a setup wizard guides you through the initial installation of MySQL products. As the following figure shows, the initial setup is a one-time activity in the overall process. MySQL Installer detects existing MySQL products installed on the host during its initial setup and adds them to the list of products to be managed. MySQL Installer extracts configuration files (described later) to the hard drive of the host during the initial setup. Although MySQL Installer is a 32-bit application, it can install both 32-bit and 64-bit binaries. The initial setup adds a link to the Start menu under the MySQL group. Click Start, All Programs, MySQL, MySQL Installer to open MySQL Installer. MySQL Installer requires you to accept the license agreement before it will install new MySQL packages. After you accept the terms of the agreement, you can add, update, reconfigure, and remove all of the products and features provided by the MySQL Installer release you downloaded. For the Commercial release, entering your My Oracle Support (MOS) credentials is optional when installing bundled MySQL products, but your credentials are required when choosing unbundled MySQL products that MySQL Installer must download. An unbundled product is any .msi file that you download using MySQL Installer after the initial setup. Your credentials must match the user name and password that you have registered with Oracle for access to the support site. During the initial setup, you are prompted to select the MySQL products to be installed on the host. One alternative is to use a predetermined setup type that matches your setup requirements. By default, both GA and pre-release products are included in the download and installation with the Developer Default, Client only, and Full setup types. Select the Only install GA products option to restrict the product set to include GA products only when using these setup types. Server only: Only install the MySQL server. This setup type installs the general availability (GA) or development release server that you selected when you downloaded MySQL Installer. It uses the default installation and data paths. Client only: Only install the most recent MySQL applications and MySQL connectors. This setup type is similar to the Developer Default type, except that it does not include MySQL server or the client programs typically bundled with the server, such as mysql or mysqladmin. Full: Install all available MySQL products. Custom The custom setup type enables you to filter and select individual MySQL products from the MySQL Installer catalog. A product or product version that is not available from the usual download locations. The catalog contains all product releases, including the other releases between pre-release (or development) and GA.
An instance of MySQL server using an alternative installation path, data path, or both. For instructions on how to adjust the paths, see Section 1.3.2, “Setting Alternative Server Paths with MySQL Installer”. Two or more MySQL server versions on the same host at the same time (for example, 5.6, 5.7, and 8.0). A specific combination of products and features not offered as a predetermine setup type. For example, you can install a single product, such as MySQL Workbench, instead of installing all client applications for Windows. When the default installation or data folder (required by MySQL server) for a product to be installed already exists on the host, the wizard displays the Path Conflict step to identify each conflict and enable you to take action to avoid having files in the existing folder overwritten by the new installation. You see this step in the initial setup only when MySQL Installer detects a conflict. Select a product from the list to display the conflict options. A warning symbol indicates which path is in conflict. Use the browse button to choose a new path and then click Next. Click Back to choose a different setup type or product version, if applicable. The Custom setup type enables you to select individual product versions. Click Next to ignore the conflict and overwrite files in the existing folder. Delete the existing product. Click Cancel to stop the initial setup and close MySQL Installer. Open MySQL Installer again from the Start menu and delete the installed product from the host using the Delete operation from the dashboard. MySQL Installer uses entries in the package-rules.xml file to determine whether the prerequisite software for each product is installed on the host. When the requirements check fails, MySQL Installer displays the Check Requirements step to help you update the host. The following figure identifies and describes the key areas of this step. Shows the current step in the initial setup. Steps in this list may change slightly depending on the products already installed on the host, the availability of prerequisite software, and the products to be installed on the host. A blank space in the Status column means that MySQL Installer can attempt to download and install the required software for you. The word Manual in the Status column means that you must satisfy the requirement manually. Select each product in the list to see its requirement details. Describes the requirement in detail to assist you with each manual resolution. When possible, a download URL is provided. After you download and install the required software, click Check to verify that the requirement has been met. Back – Return to the previous step. This action enables you to select a different the setup type. Execute – Have MySQL Installer attempt to download and install the required software for all items without a manual status. Manual requirements are resolved by you and verified by clicking Check. 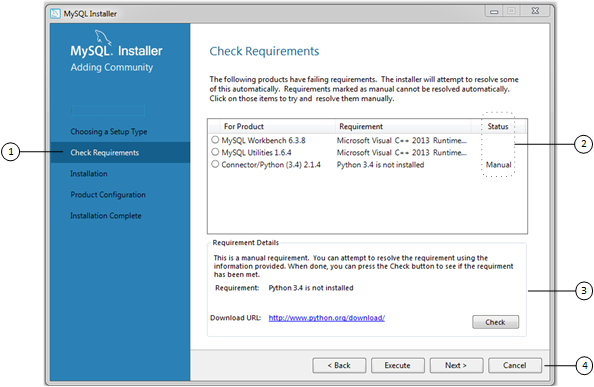 Next – Do not execute the request to apply the requirements automatically and proceed to the installation without including the products that fail the check requirements step. Cancel – Stop the installation of MySQL products. Because MySQL Installer is already installed, the initial setup begins again when you open MySQL Installer from the Start menu and click Add from the dashboard. For a description of the available management operations, see Product Catalog. All MySQL Installer files are located within the C:\Program Files (x86) and C:\ProgramData folders. The following table describes the files and folders that define MySQL Installer as a standalone application. Installed MySQL products are neither altered nor removed when you update or uninstall MySQL Installer. This file contains the prerequisites for every product to be installed. The products file (or product catalog) contains a list of all products available for download. The Product Cache folder contains all standalone .msi files bundled with the full package or downloaded afterward.